I’ll direct your attention to various rings, where you’ll read the latest experiences, stories, ideas, tricks and wisdom relating to Humor in the Workplace. Anything else you think is related to Humor in the Workplace. If you are able to connect fun and work, it will be considered for this Carnival. Examples of humor with management and leadership in the office setting. What is a Blog Carnival? As defined by Wikipedia, “A blog carnival is a type of blog event. It is similar to a magazine, in that it is dedicated to a particular topic, and is published on a regular schedule, often weekly or monthly. Each edition of a blog carnival is in the form of a blog article that contains permalinks to other blog articles on the particular topic. Blog carnivals are a great way for bloggers to recognize each other’s efforts, organize blog posts around important topics, and improve the overall level of conversation in the blogosphere. They also serve as a place to connect with those who are expert (or at least highly opinionated!) and those who are interested in that field. Why participate in a blog carnival? Simple. First of all, it’s cool to have a single clearinghouse for related articles about Humor in the Workplace. And this carnival will help others find you. In addition, you’ll get backlinks (incoming links to your blog). The more backlinks your blog has, the higher rating in search engines. Plus it’s just fun! How to participate? Submit your posts by clicking here or via the “Humor in the Workplace Blog Carnival” submission box below or email a link to your blog post. All we ask is that you link back to this carnival on your blog – I’ve got a super-cool button coming soon! Thanks for playing! Now let’s have some fun! https://www.bradmontgomery.com/wp-content/uploads/2018/11/logo-1-495x198-1-300x120.png 0 0 admin https://www.bradmontgomery.com/wp-content/uploads/2018/11/logo-1-495x198-1-300x120.png admin2008-10-31 20:25:412016-11-02 08:04:31Welcome to the Big Top! The Washington Post reported that AIG went through with a convention for their top earners. Lawmakers fumed last week when they learned that the company paid $440,000 for a week-long resort retreat in California for top-performing insurance agents. The expenditure occurred just days after Sept. 16, when the government announced its $85 billion loan. This month, as AIG asked for an additional $38 billion in taxpayer financing, top AIG executives spent thousands on a hunting trip in England. often hire motivational speakers and humorists…so it certainly is possible that one was hired for this event. Imagine YOU were hired by AIG. You see them go out of business…and be rescued with $85 Billion taxpayer dollars. You know now that you are no longer being paid by AIG, but the taxpayers via AIG. Would you take the job? Theoretically you’ve had this keynote on the books for some time, you have turned down other clients who wanted to hire you as a motivational speaker, and because you’ve done everything you have been asked to do, you deserve the fee for you speakers services. But now that it’s a taxpayer nightmare and Wall Street scandal, would you take the job? https://www.bradmontgomery.com/wp-content/uploads/2018/11/logo-1-495x198-1-300x120.png 0 0 admin https://www.bradmontgomery.com/wp-content/uploads/2018/11/logo-1-495x198-1-300x120.png admin2008-10-30 12:14:162016-11-15 09:20:46What Would You Do? Take AIG's Money or Not? 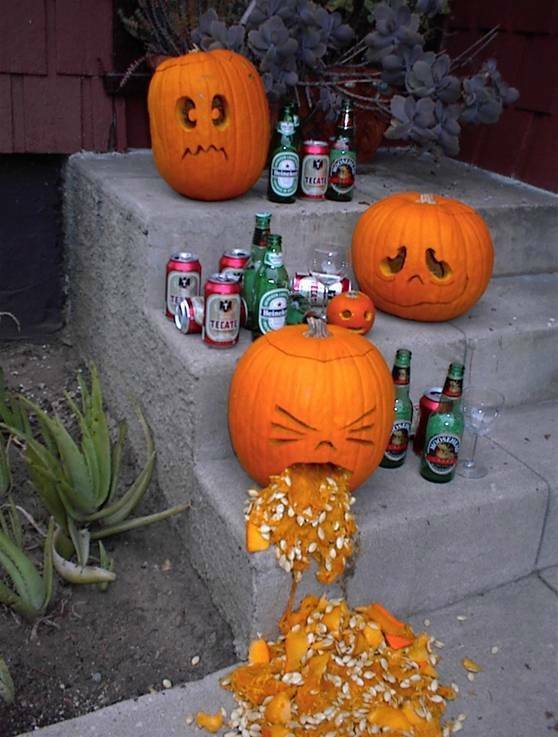 I love halloween…. it’s about the only time of the year that we, as adults, can dress up and act weird and not get fired. And we can do it sober. Besides dressing up — this year I’m gonna dress as a rock star — I love to kid around with the little trick or treaters that come by the house: They say “trick or treat!” I answer, “Ok, I pick Trick.” They are dumbfounded. I explain. I’ll take the trick. They are dumfounded. I eventually give all the kids real candy of course. But this time of year is a great time to goof. LaffyTaffy is a crappy, horrible, nasty candy. And I love it. The interesting thing about LaffyTaffy is that it makes my kids laugh. Really. They believe that when you eat it, you laugh. Seriously; they eat some, and they laugh. So, what’s this got to do for the rest of us? My point is that sometimes laughter is a decision. Sometimes laughter is a choice. Sometimes being in a giggly, laughing mood is as simple as DECIDING that you’re gonna be in a good mood. I know that it isn’t always that easy. Simple yes. Easy, no. I know that with the genuine and frequent stressors we face as adults it isn’t always EASY to just drop things and giggle. But kids and LaffyTaffy prove that laughter is a state of mind. My point? Next time you’re in a lousy mood see if you can talk yourself out of it intoand into a good mood. It’s possible, and kids prove it. And if that fails, and as a last resort, have some of that LaffyTaffy. Hate LaffyTaffy and prefer to bring in a funny motivational comedian speaker to cheer up your troops? Click here for more info. I don’t care what side of the political divide you’re on, Sarah Palin makes for some tasty jokes. http://www.palinaspresident.us/ Who has time to make this stuff? Tim Conway has to be one of the best sketch comedians ever. I grew up watching him, Carol Burnett and Harvey Korman make each other laugh. What impresses me about this clip is that it holds up. It is still funny today. (And how many shows from the 70s can we say that about? Happy Days? No way, Fonzy! As a professional speaker and comedian, I love watching how he cracks the other actors up, and how their laughter makes the sketch even funnier. He’s funny on his own, but with the his team members busting up he is hilarious. The other folks laughter turns the sketch from good to great. This fact is relevant to us in our search for a fun business culture. Laughter begets laughter. If you want to ramp up the fun in your office and the humor in your workplace, you can start by laughing more yourself. And if you are a leader or manager, make sure that you make certain others feel safe laughing around you. Employees are often nervous about letting loose in front of their boss: don’t let your people fall into this trap around you. If you are laughing the hardest, your employees will follow. Trust me on this. killer professional speaker. Can you imagine having him as your motivational keynote speaker? Heck yeah! Imagine him (and his team of comedians) do one of these killer sketches and then connect the learning points to corporate America. I know he would have the convention or meeting on the edge of their seats because he is so funny. But I bet when he connects his communication skills, timing, teamwork and ability to deal with constant change to the business and corporate culture, he’d hit it out of the park. I know I would pay to see it. 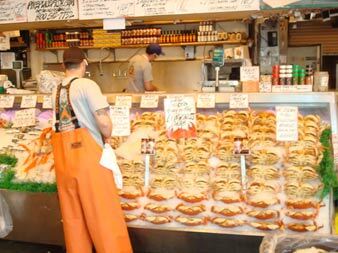 As you know (unless you’ve lived in a cave) the Fish Market is famous for a fun atmosphere — and for turning that fun atmosphere into a healthy profit. Tourists and customers gather to watch the fun as the fish mongers literally throw fish, laugh and joke with customers, and generally enjoy their work. The result for the fish market is more than fun and smiles: it’s a thriving business. A world-famous thriving business. It’s a totally cool place with a totally cool concept. (Hey Mom! I used “totally cool” twice!) It’s also been beaten like a dead horse. Ok already! Throwing fish is fun. It’s been the inspiration for many a motivational speaker, a series of motivational videos, courses and other products. If I had a nickel for every time I’ve been asked, “Brad, have you heard about the Fish Philosophy?” … I’d have…. well, a couple of bucks at least. 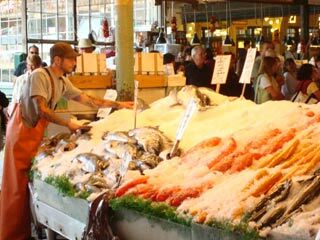 If the thought of reading a blog post about the fish market makes you want to hurl, stick with me….I’m headed somewhere. 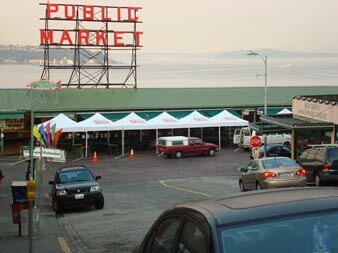 Watching the “show” at the market reminded me that a fun workplace doesn’t require funny people. You don’t have to be a funny, joke telling manager or leader to create a pleasant work environment. At the Market, I didn’t see a single comedian. I didn’t hear a single joke. What I did see was a staff that had been empowered to be (and have) fun at work. So what was so fun about the fish market if it wasn’t flying fish? In a word, the fun was in the work culture. They are having so much fun it is infectious. My point? This fish market encourages it’s employees to have fun. It makes it safe for them to have fun. And it rewards them for having fun. If you want your work culture to be more fun and funny, remember that you don’t have to be funny yourself. You just have to do your part to encourage others to be fun. * Ok, not really. I’ve honestly never thown a fish. A small rabbit** perhaps, but never a fish. ***I’m joking again. It’s a bad habit. But hey, it’s my job. ****Are you looking for the site above where there was “****” There isn’t one. This footnote is just a little added bonus joke. Ha ha. Get it? Ok, me neither. Do you think humor increases your ability to perform? I just read (belatedly…. It’s been busy) an article about the golfers in the The Ryder Cup. One US player, Anthony Kim, had everyone on the US team laughing. 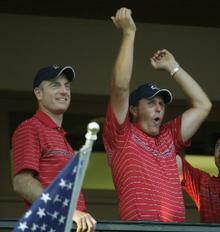 “He’s a funny guy,” said Paul Azinger, the USA team captain. And then, after a 9 year drought, the USA team beat the Europeans. The Rocky Mountain News reported that usually it’s the European team laughing it up, teasing each other, and generally keeping the tone light. This year, it was the American team. Could humor have been the deciding factor in the Ryder Cup? Almost certainly. Sure, skill is important. Sure, confidence and other mental factors enter into the equation. But in this case, it looks like laughter might have been the not-so-secret weapon. Hey golfers! Next time you’re thinking about buying that $300 driver or the $400 putter? Perhaps your money would be better spent buying some audio recordings of your favorite funny speakers or comedians. Hey kids….why not listen to me? https://www.bradmontgomery.com/wp-content/uploads/2018/11/logo-1-495x198-1-300x120.png 0 0 admin https://www.bradmontgomery.com/wp-content/uploads/2018/11/logo-1-495x198-1-300x120.png admin2008-10-20 02:07:162008-10-20 02:07:16Humor and Golf? I got a kick out of this funny tee shirt. What cracks me up is how this shirt isn’t far from the truth. 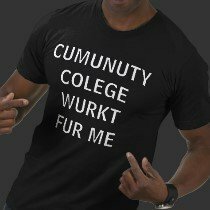 Would you have the guts to wear it to a community college? How else could you offend the “hand that feeds you?” What is the worst tee shirt you could imagine wearing at work? My Manager is Insecure and Incompetent. This hell hole barely passed the heath inspection. How far could YOU go to slam your workplace? When does a slam turn from funny to offensive? Let me know. PS. My brother is a college counselor / advisor, and I doubt even he could get you into school if you can’t spell community college. https://www.bradmontgomery.com/wp-content/uploads/2018/11/logo-1-495x198-1-300x120.png 0 0 admin https://www.bradmontgomery.com/wp-content/uploads/2018/11/logo-1-495x198-1-300x120.png admin2008-10-17 23:02:252008-10-17 23:02:25Create the Worst Tee Shirt Ever? As I blogged earlier this week, I was recently invited to do my motivational humorist speaker thing in Washington for Microsoft. 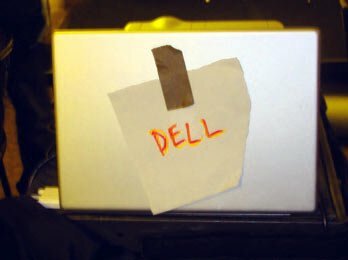 I was speaking about using humor at work, and I knew they “got it” partly because they decorated my Mac by sticking a hand-written “DELL COMPUTER” sign over the obvious Apple logo. They laughed. I howled. The only thing wrong with this killer idea is that I didn’t think of it first. I’ve said it before: my favorite clients are the ones that teach me something. I learned plenty from the folks at Microsoft Finance North America. Thanks Kids! PS. Hey Microsoft! I’m typing this blog post on my new Dell with Vista! Really. No promise! Really! PPS. Big shout out to Alan for the Dell sign, the Sparky joke, and the laughs!